Our Spring 2019 show includes a rare find and yet another mystery as well. The envelope containing the negative was inscribed with “The Gathering” and at first glance you can see why. However, a closer look shows much more. 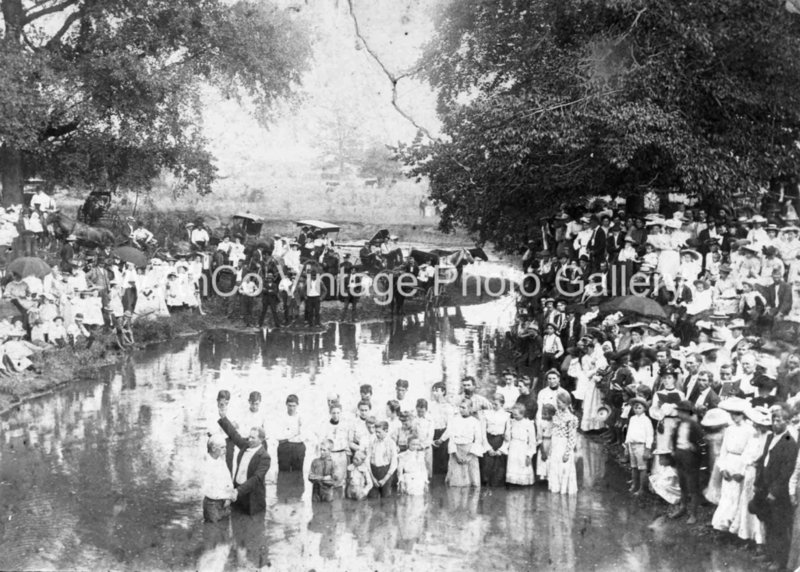 This early 1900’s photo depicts a primitive baptism in a stream. As people on the shores gather to watch, a man prepares to baptize a man while others seem to be next in line. But where is this? Well, that’s part of the mystery. When was this taken? That’s another part and then there is the question of how did this get into the Orman Collection? Dating photos can be rather difficult, but you can make an educated guess from the clothing… mostly the ladies’ fashion, because then as now styles change. We are guessing somewhere in the 1900 – 1910 based on hats and dresses. Where a photo was taken can be easy (when a landmark is present) or, as in this case, nearly impossible. A stream in a field with livestock? That could be anywhere in this part of the Country, right? Although, we have had someone come in and identify their pool. So, we may get lucky and have somebody recognize this landscape. As for the last question, W. A. Orman not only took photos, but he also appreciated them. Fortunately for us he was quite the collector and we are always pleasantly surprised to find photos just like this. Come see The Gathering in person. It is worth a visit. We also have several other great photos in our latest show “Days of Parades” at W7thCo.